Body lotion "Glysolid" contains mild formula suitable for the most sensitive skin, namely extract and chamomile acting anti-inflammatory and antibacterial. 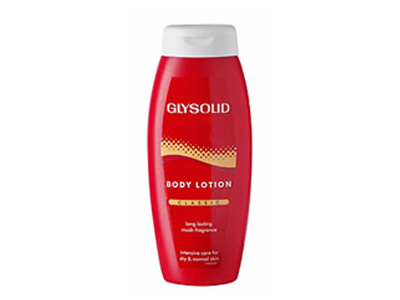 Lotion softens and soothes irritated skin without leaving a greasy residue. Nourishes and protects from the harmful effects of the environment. Bioactive substances in its composition, normalize metabolic processes in cells, improve skin texture and smooth complexion. Maintain the natural moisture level throughout the day, retain its natural balance and makes her glow with health and beauty. Cosmetics Glysolid is of high quality and widely used. Characteristic constituted a high percentage of glycerin contained in the products her Glycerol is a liquid - sweet, colorless and dense. Extremely hygroscopic, which means it can absorb water from the air. It is interesting how a drop of pure glycerol can be dehydrated so strong as to make the skin wound, and when diluted with water hydrates. Glycerin softens and moisturizes your skin! Application: suha, boleznena, napukana and dehydrated skin.